Well it turned out to be a meeting of the local chiefs. SABC TV was invited to document the happenings for Roots program on TV 3. Then there was entertainment from community groups that did dance and played traditional music( with electric guitars,keyboards and drums).I was squeezed into program. However there was no screen to put up my presentation. Expecting this would happen I resorted to presenting some of equipment needed to take long trip on a bicycle. Ending in businesses and uses of bicycles to help create a living for people. There was a second presentation of a Chines engine that is bolted onto bicycle frame.This mode of transport will give you one liter petrol to 100 km. This drew a lot of attention. There is a big demand for cheap modes of transport out in these very rural communities. As a result one of the chiefs gave permission for a community activist to get a office at his offices. Here she can train children to ride bicycle and teach them to repair them. She will also co ordinate giving sponsored bicycles to deserving learners, to help them get to school. They are setting up a web page for interested persons. 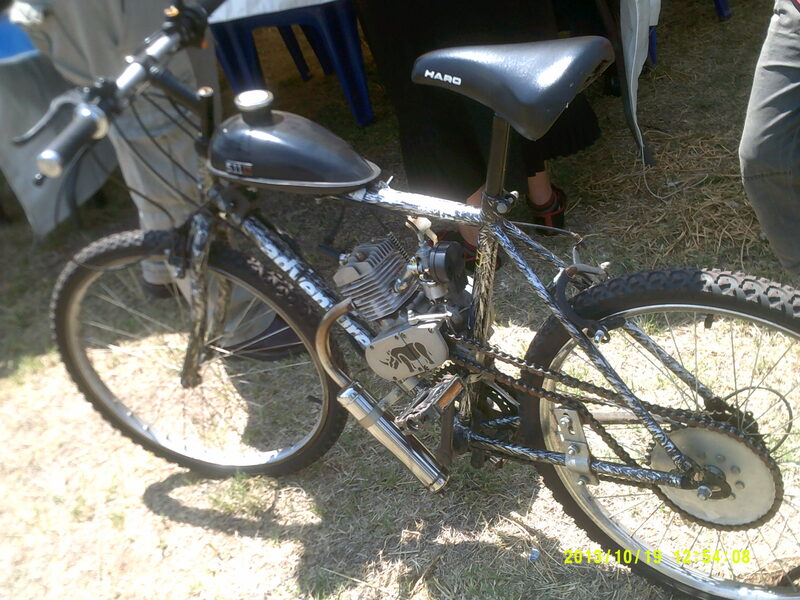 This entry was posted in Uncategorized and tagged bicycle, community groups, motorized bicycle by krfarmer. Bookmark the permalink.